John E. Fogarty, ca. 1945. In January of 1941, a twenty-seven year old Rhode Island bricklayer named John Edward Fogarty began his first term in the U.S. Congress. A union member and New Deal Democrat, Representative Fogarty was determined to be an aggressive advocate for labor interests. He probably never imagined that he would become known instead as one of the Congress’s foremost champions for medical research, public health, and health care services, his name associated with virtually every piece of health-related legislation passed between 1947 and 1967. Fogarty’s career in many ways embodies the story of post-World War II health and social legislation, Congressional bipartisanship, and the phenomenal growth of the National Institutes of Health. Congressman Fogarty (1913–1967) is the subject of NLM’s newest Profiles in Science site. The site features a rich selection of correspondence, legislative records, speeches, interviews, and photographs from the John E. Fogarty Papers held by the Phillips Memorial Library, Special and Archival Collections at Providence College in Providence, Rhode Island, along with many photographs and other materials provided by the Fogarty family. John Fogarty was born on March 23, 1913, in Providence, Rhode Island. He graduated from LaSalle Academy in 1930 just as the Great Depression was setting in, and instead of going to college, became a bricklayer like his father and older brother. 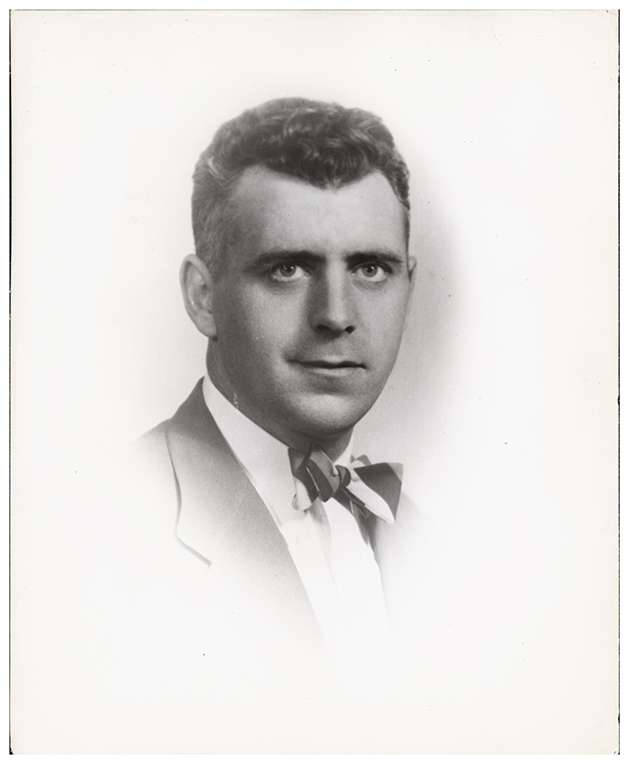 He served as president of the Bricklayers Union local chapter for four years, and then, in 1940, ran for Congress. In Washington, he was initially focused on labor issues, and served on the House Naval Affairs Committee for six years. In early 1945, hoping to gather firsthand information about the situation of enlisted men, especially in the Construction Battalions (“Seabees”), he joined the Navy for six weeks to work among them undercover. In 1947 Fogarty was appointed to the House Appropriations Committee’s Subcommittee for the Department of Labor and the Federal Security Agency (which became the Department of Health, Education, and Welfare in 1953.) He wasn’t especially interested in the health and education funding discussions at first. However, he soon saw that federally supported research, public health programs, and services to the disabled were crucial to improving the health and well-being of working Americans, especially the less affluent. During his twenty years on the Labor-HEW subcommittee—sixteen of them as chairman—Fogarty’s legislative work redefined and vastly expanded the federal government’s role in medical research and public health. 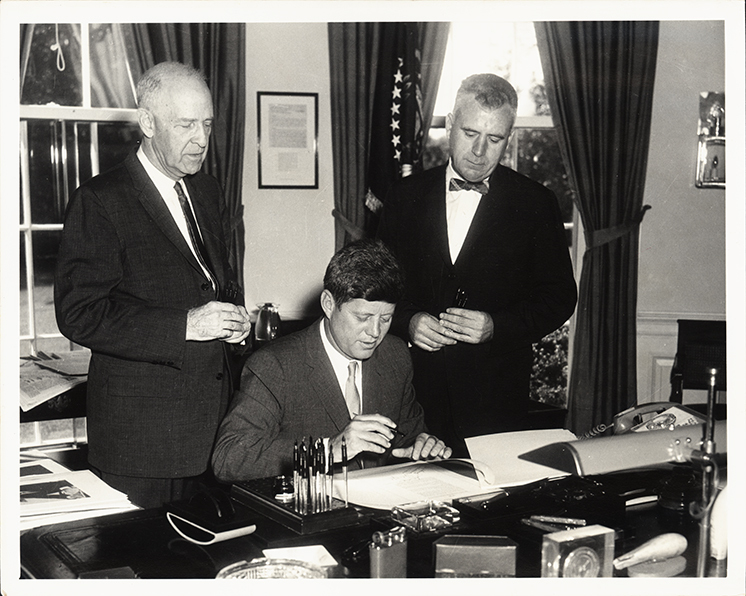 John E. Fogarty and Senator Lister Hill watch President John F. Kennedy sign the 1962 appropriations bill for the Departments of Labor and Health, Education, and Welfare. 22 September 1961. Much of America’s current “social safety net” was constructed through the efforts of Fogarty and like-minded colleagues, working together with a coalition that included educators, health professionals, citizens’ groups concerned about specific diseases and conditions, and the heads of government education and public health agencies. It was a notably bipartisan coalition as well—one of Fogarty’s closest allies and friends was Melvin Laird (R-WI), who later became Secretary of Defense. The scope of their achievements is remarkable. A partial list includes: federally funded research and services for blind, deaf, and mentally retarded children; rehabilitation services and special education; construction of research facilities, expansion of medical, dental, and public health education; construction of community mental health centers and public health facilities, and international health research projects. Central to their efforts was a vast expansion of research into diseases and cures, mainly through the National Institutes of Health. The NIH—which now supports most of the biomedical research in the U.S.—grew from three institutes with a budget of $28.5 million in 1949 to ten institutes with a budget of over $1 billion in 1966. Fogarty’s interests also extended beyond health care and research. He was a staunch advocate for support of libraries, both public and medical, sponsoring several Library Services Acts; he introduced the legislation that culminated in the Older Americans Act in 1965; and he was the original sponsor of the bills that established the National Endowment for the Arts (NEA) and the National Endowment for the Humanities (NEH); this year the NEA and the NEH are celebrating their 50th anniversary. Fogarty was also an advocate for other major Great Society programs such as Medicare and the Economic Opportunity Amendments. We invite you to explore the John E. Fogarty site on Profiles in Science and learn more about his story through documents such as his speeches, letters to his colleagues and constituents, conference reports from the appropriations subcommittee, and the journal he kept during his World War II Navy service. Or watch the video interview with Fogarty’s colleague and friend Melvin Laird, done in 2014 and generously donated to NLM by Mary Fogarty McAndrew and her husband Thomas McAndrew.